Weekends are so much more enjoyable when you start them with something amazing for breakfast. You suddenly have a reason to linger over the paper, make a second pot of coffee, and delay your trip to the hardware store. What more could you ask for? 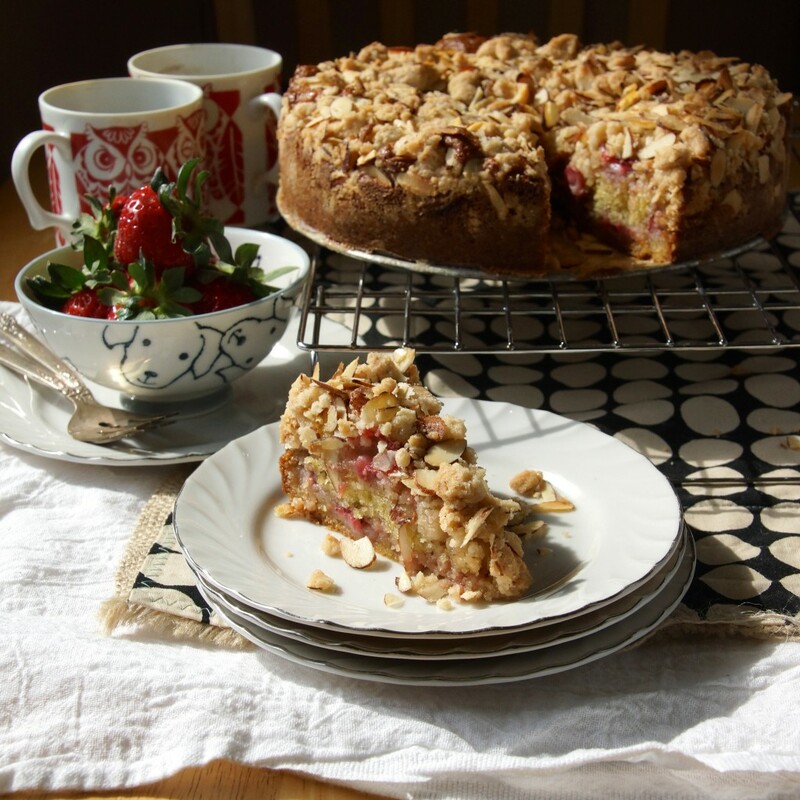 This weekend it’s an ultra-moist strawberry coffee cake smothered in a ridiculously good, I-want-to-pick-it-all-off-and-eat-it-right-now almond crumb topping. It goes together quickly and depending on how many people you choose to share it with, it might be around long enough to perk up your back-to-reality Monday morning breakfast. We’ll start with the best part, the almond crumbs. Melt some butter. Mix flour and sugar with a spoonful of cinnamon and a pinch of salt. Stir the butter in and add a cup of sliced almonds. Don’t forget to sample–quality control is a duty that should never be overlooked. Okay, step away from the bowl of pure, buttery deliciousness. It’s time to make the rest of the cake. Quarter a bunch of strawberries and set them aside while you make the cake batter. Cream butter and sugar. Whisk together flour, soda, powder, and salt. Mix sour cream or yogurt with an egg, lemon zest, and a splash of vanilla. Add a third of the dry ingredients to the creamed butter, followed by half of the wet. Repeat and finish up with the remaining dry ingredients. Now we assemble. Butter and flour a springform pan. I line mine with parchment, for good measure. Spread 2/3 of the batter in the pan. Scatter half of the strawberries over the top. Spread the rest of the cake batter right over the strawberries and sprinkle the remaining berries right on top. Cover with the almond crumb and bake. It’ll take longer than you had hoped–the thick crumb layer insulates the cake, but don’t fret, it’ll be worth the wait. Cool for as long as you can bear. Dig in and dig a relaxed start to what’s going to be a great weekend. 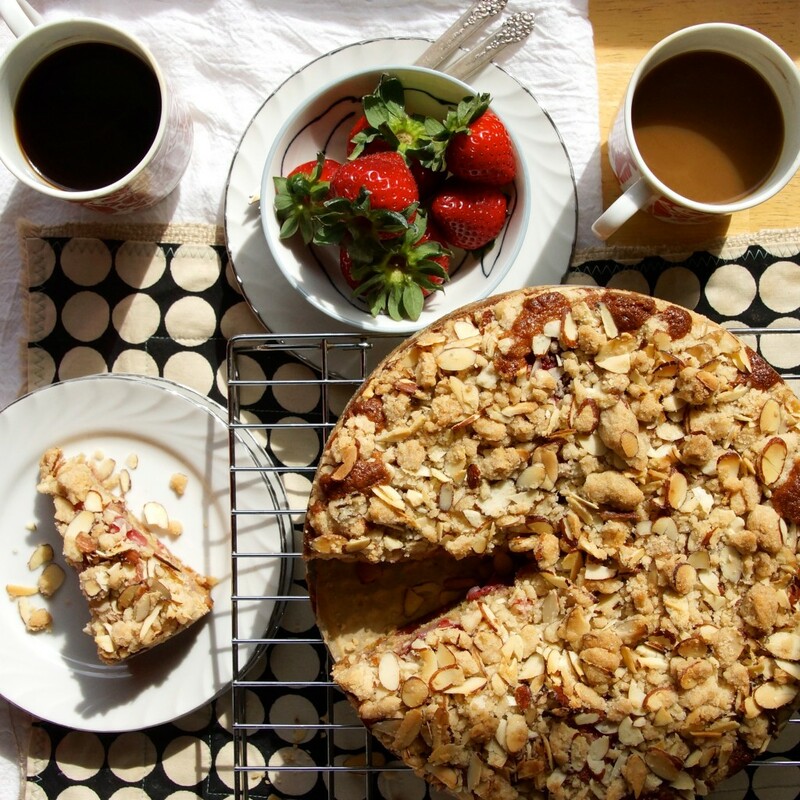 I imagine this coffee cake would be excellent made with just about any fruit that's in season--blueberries, raspberries, peaches, plums, pears, etc. If using a different type of fruit, the baking time may need to be adjusted. Preheat oven to 350°. Butter and flour a springform pan. To make the crumb topping, combine flour, sugar, cinnamon, and salt in medium bowl. Add the almond extract to the melted butter and add the mixture to the dry ingredients. Stir until crumbs begin to form, then gently stir in the almonds. Set to the side while you prepare the cake batter. In the bowl of an electric mixer, cream the butter and sugar until light and fluffy. Whisk together the eggs, sour cream or yogurt, vanilla, and lemon zest in a small bowl. In another bowl, whisk together the flour, baking soda, baking powder, and salt. With the mixer on low, add about a third of the dry ingredients, followed by half of the wet ingredients. Repeat and finish with the remaining dry ingredients. Spread about ⅔ of the cake batter in the prepared pan. Scatter about half of the strawberries. Spread the remaining cake batter over the strawberries and scatter the remaining strawberries on top. Evenly sprinkle the almond crumbs over the strawberries. Bake until a tester inserted in the center comes out clean, about 1 hour and 5 minutes. Cool on a rack for 20 minutes before serving. When I use with a springform pan, I always place an empty baking sheet on the rack below to catch any potential leaks because it's always better to wake up your boyfriend/girlfriend/children/spouse with the sweet scent of freshly baked coffee cake rather than the ringing of a smoke detector. I might have that for breakfast!!! Glad you enjoyed it at I’ll look for it on your blog soon! What sugar is used? Castor? I used regular (American) granulated white sugar. I’ve never baked with caster sugar, but I understand it’s a bit finer. I doubt using it would make much difference in the end product. Good luck! Hi, Sarah! I just found you via a comment you left on Food52.com & am so glad I did. I don’t usually comment but wanted to say how absolutely gorgeous I think your photography is here; so exquisite, in fact, that I know your recipes must be equally wonderful. I look forward to exploring the rest of your site, AND to trying this coffee cake that your photos have made so impossible to pass by. Thank you so much for sharing your talent and taste with us. Baking in my battered 30-yr-old oven right now in the Brazilian countryside! Can’t wait to try it, it smells so wonderful already!! I used chunks of thick strawberry jam because I had it on hand, and used thickish kefir instead of sour cream, and I am SO excited! Thanks!! This looks super yummy, what size springform pan did you use?